This is a ride for all terrain bikes. It could be done on a hybrid bike in good weather. The group of artists centred round Furlongs in Beddingham is less well known than the Bloomsbury Group along the road, but their paintings are better. We also see feudalism at work and follow celebrity vicar Peter Own Jones. 1). If arriving by train from Lewes, leave the platform by the steps, turning right up further steps to the road. On reaching the road turn right and round the bend the Trevor Arms. If arriving by train from Eastbourne leave the platform via the ramp. At the end of the ramp you will see the Trevor Arms ahead of you. 2). The ride continues straight ahead up the main street of the village. The street bears left past the village hall. Note the attractive estate houses. These are less uniform than those in Glynde and there are a number of houses which are not owned by the estate. On the left are two tall Victorian houses. One of these was home to Virginia and Leonard Woolf for a short time before they settled in Rodmell. The street turns right. Follow it. You pass the village shop and the last bus stop of the 125 route. 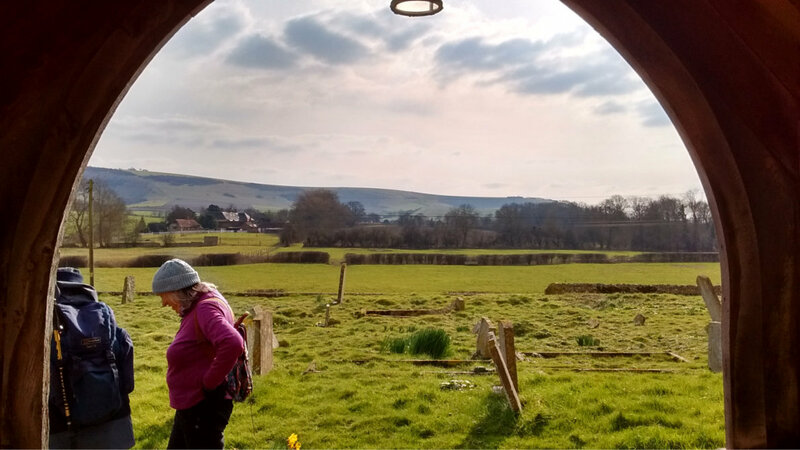 Pass the church and the route to Firle Place. The route becomes a rough track. Keep straight ahead. You emerge on to the downland ridge. Turn right here on the South Downs Way. Pass the car park and head on towards the radio masts on Beddingham Hill. There are excellent views on this part of the ride. You can see the low weald, the downland ridge, Mount Caburn and the Newhaven incinerator. Past the radio masts the way dips slightly. Near the lowest point is a junction of paths. Just before the byway meets the busy A26, the boundary hedge turns away to the right. A tarmac path, almost covered in grass runs parallel to the hedge to meet the A26. Carefully cross the road here. To your right you will find a pavement which will take you all the way to Beddingham village. 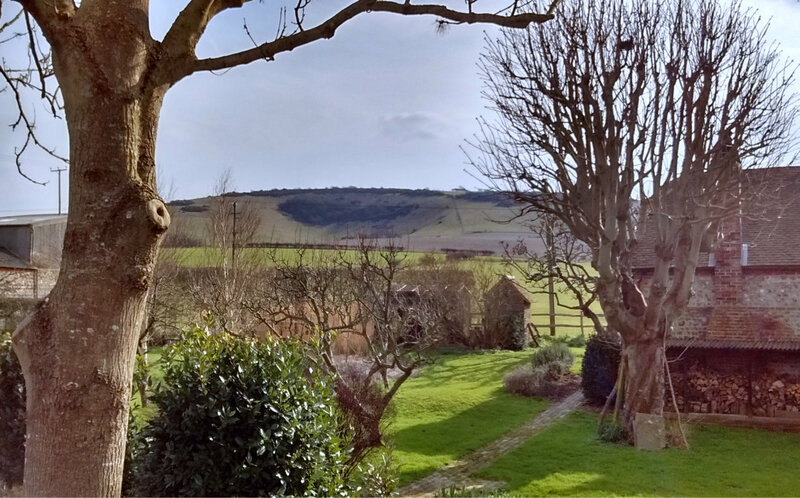 (F) You must ride alongside a busy road here but you are compensated by open views across the Ouse Valley and some attractive Glynde Estate houses. 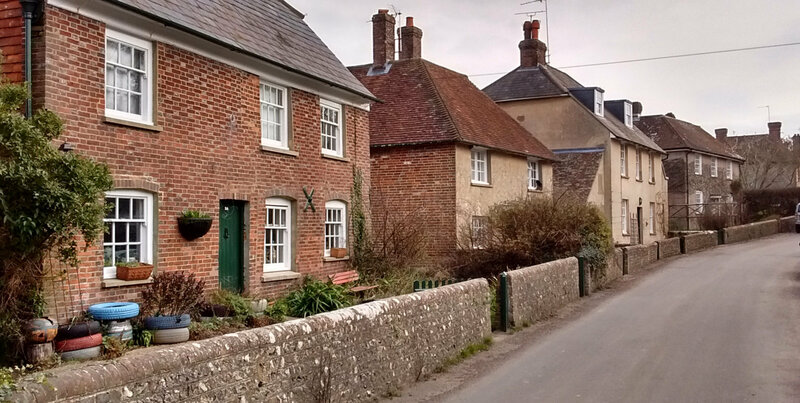 You pass Cobbe Place, which does bed and breakfast and other holiday accommodation. As this walk is about history and context, you will probably get more out of the walk if you read this section before doing the ride.